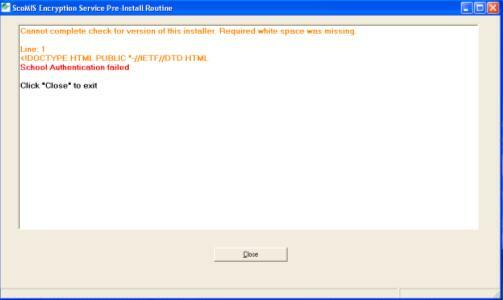 The installation routine is attempting to connect to the Scomis website to see if it is the latest version. In this case the message is related to an unexpected response which means the request is not coming back from the website and is probably coming back from a proxy server. This is normally due to mis-configured proxy exceptions. You can continue with the installation as normal because this is only a warning that the installation routine can’t check it if is up to date. ScoMIS will email schools if the installation routine is ever updated and once the initial encryption has been done upgrades to the software are automated. Posted in Deployment, Encryption, Services and tagged Cannot, check, Encryption, error, installation, installer, proxy, version, warning, whitespace.